For many golfers booking a Thailand golf holiday, the first port of call of will be Bangkok. This is the capital city of Thailand and is home to some of the best golf courses in the country. However, you are not restricted to playing the courses in Bangkok and you can easily branch out a little further to include golf courses near Bangkok. Bangkok is the largest and most populous city in Thailand. It is home to a blend of traditional and modern architecture and was once two capital cities divided by a wall before they became one and renamed as Bangkok. This is one of the most cosmopolitan cities in the world and you will find everything from canals, markets, temples, palaces, shops, restaurants, street food and great nightlife in addition to the world class golf. Getting to the Thai capital to play the top golf courses near Bangkok is easy thanks to two airports. Suvarnabhumi Airport is the largest and most popular of the two and if you travelling to play the golf courses near Bangkok from outside the county, this is likely to be your arrival point. Bangkok is just 30 kilometres away from the airport and you will have little trouble reaching the city centre thanks to the choice of transport. When playing golf near Bangkok, you must take the climate into consideration. The best time for playing golf in and around Bangkok is between November and February. August and September are the months to avoid if you want a good chance of missing the rain but when it does rain in the Bangkok region, it is often in short, sharp bursts. Having decided when you are going to travel, you must consider which of the golf courses near Bangkok you would like to include on your itinerary. There are many to choose from and we have included what we feel is the best selection. Just 30 minutes away from the city centre you will find Navatanee Golf Course and this is regarded as one of the best golf courses near Bangkok. This 18-hole, par-72 golf course was designed by Robert Trent Jones Jr and has been a fixture on the Bangkok golf scene for many years. Opened for play in 1973, it took only a couple of years for Navatanee Golf Course to become established as one of the best in Thailand. In 1975, Navatanee Golf Course hosted the World Cup of Golf and has since staged the Thailand Open. The golf course is always in good condition and is well maintained by the staff throughout the year. Water comes into play on several holes and the par-3 17th hole is a great example, as it features a tee shot over water to the green. There is no option to play safe here as bunkers are in play on the right side of the hole, meaning a shot over water is the only option. Water also comes into play on the 6th hole, which is the signature hole of Navatanee Golf Course. Water guards the left side of the fairway and there is lake in-front of the green meaning most golfers are happy to walk away with a par. The clubhouse has a restaurant which sits over the 9th hole and the changing and shower facilities have recently been updated. Navatanee Golf Course is one of the top golf courses near Bangkok and a great place to begin a Bangkok golf holiday. Bangkok Golf Club was established in 1993 and designed by Chird Boonyarattanevet. Is has hosted several professional events including the Asia Tour Volvo Masters but since then the course has been redesigned making it more suitable to players of all abilities. The course at Bangkok Golf Club plays to 6,812 yards off the back tees, which is quite short and a round is always very pleasant thanks to the great conditioning and wildlife around the course. However, the fairways are narrow and the golf course has many water hazards which means you must keep focus to score low. The greens at Bangkok Golf Club are regarded as some of the best in Thailand and they are both fast and undulating. Complete with a driving range, putting green, chipping areas, pro shop, locker rooms, cocktail lounge and a choice of international and Japanese restaurants, you are assured of a great day playing golf at Bangkok Golf Club. Even if you are short on time but would like to play a couple of rounds of golf in Bangkok you have options. 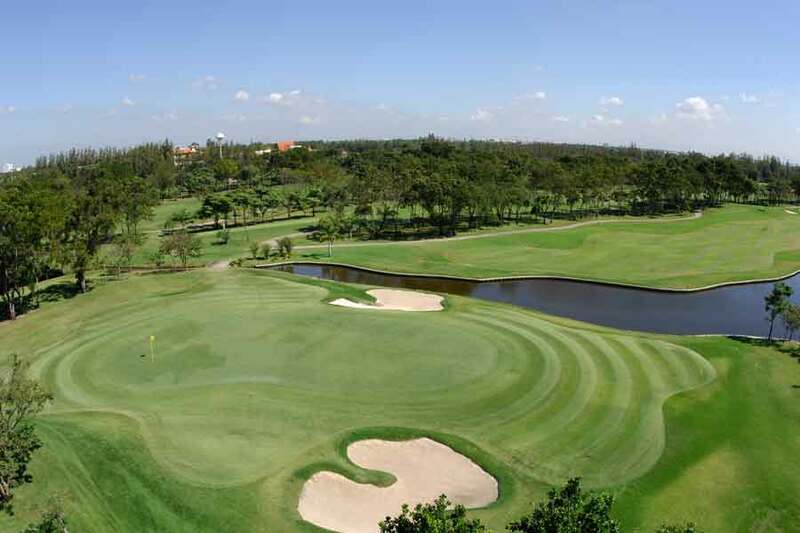 To the south of the city centre and just 20 minutes away from Suvarnabhumi Airport you will find Muang Kaew Golf Club. This is another Bangkok golf club which opened for play in the 1990’s and was designed by Lee Schmidt and Brian Curley. The 18-hole, par-72 golf course plays to 7,015 yards off the back tees and has proven very popular with local players. The greens are the standout feature of Muang Kaew Golf Club, many of which have significant undulation and are well protected throughout by bunkers and water. Some of the bunkers are high lipped and can be difficult to escape. The par-5, 13th hole is arguably the most memorable at Muang Kaew Golf Club and you must play a tee shot over a road whereas the second and approach shot must deal with water and bunkers surrounding the green. For many this is a make or break hole in terms of the round and presents an exciting challenge. Facilities include locker rooms, a pro shop, restaurant and swimming pool plus accommodation which is handy if you are heading to or from the airport. Also close to Suvarnabhumi Airport is Green Valley Country Club. Just 45 minutes from Bangkok city centre and 20 minutes from the airport, Green Valley Country Club is the second of the golf courses near Bangkok to be designed by Robert Trent Jones Jr. The terrain of the golf course if flat, making it idea for walking but if it is hot, you may decide to opt for a buggy. As with many of the golf courses near Bangkok, most of the fairways are flanked by water and the greens are fast. The first hole offers a glimpse of what is to come with a tee shot over water before an approach shot to a green which is guarded in the left and right by sand. It is a pleasant par-4 to begin the round and more daunting tasks lay ahead but with much the same type of challenge. Green Valley Country Club offers a luxurious clubhouse, which is regarded as one the best of all the golf courses near Bangkok. You will find locker rooms, sauna, swimming pool, snooker room and an international restaurant to enjoy following an excellent round of golf. You do not have to travel far from the city to find most of the golf courses near Bangkok and another tremendous golf course within a 45 minute drive of the city centre is Summit Windmill Golf Club. Designed by Nick Faldo, the course required plenty of work to create and this can be seen in the elevation changes and hill side fairways. Many locals play this course in the evening thanks to the flood lighting and while Summit Windmill Golf Club is still within the confines of the city, the surrounding area is nice, with parks and wildlife. Water is the main hazard at Summit Windmill Golf Club and you will find it in abundance, especially on the par-3 holes. The 12th hole is a great example thanks to the island green but many of the holes offer the chance to play risky shots over water and reduce the distance to the green. You will struggle to find a more impressive club house near Bangkok than the one at Summit Windmill Golf Club. It is reminiscent of a European castle and there are several golf villas dotted along the edge of the golf course which can be booked if you would like to stay on-site. Summit Windmill Golf Club is a little more artificial than many of the other golf course near Bangkok but if you would like to try a round of golf at night, it is the perfect venue. From one golf course designed by a great former player to another and Greg Norman has just one golf course in Thailand it can be found just under an hour away from the centre of Bangkok. Thana City Country Club opened for play in 1993 and features one of the best drainage systems of any golf course in the region. Thana City Country Club has played host to several big tournaments over the years including both the men’ and ladies Thailand Open plus the final round of the Johnnie Walker Super Tour back in 1996. Some of the biggest names in golf have played on this course including Ernie Els, Greg Norman, Ian Woosnam and local hero, Thongchai Jaidee. There are no less than four island greens on this course, which makes approach play very interesting. There is plenty of water situated around the course but you cannot afford to take your eye off the sand as the bunkering is frequent and strategically positioned to catch you out. Thana City Country Club boasts a modern club house, swimming pool, pro shop, golf academy and a choice of delicious cuisine from around the world in the restaurant. Another fantastic golf course near Bangkok is Riverdale Golf Club and this is just 40 minutes from the city. Designed by Jon Morrow and Al Tikkanen, this is regarded by many as one of the best golf courses near Bangkok and it is easy to see why. The course offers a great variety throughout the 18 holes, whether it be lakes, raised greens, rolling fairways, hills, quality bunkering or subtly breaking greens, you will find it all at Riverdale Golf Club. The 6th, 7th and 8th holes are regarded as the best stretch of golf at Riverdale Golf Club and being a par-5, par-4 and par-3 respectively there is a great deal of variety. The 8th is especially impressive, with a choice of green including an island green and postage stamp, with pot bunker. When playing at Riverdale Golf Club, the decision is yours as to which green you would like to play. The clubhouse overlooks the 10th and 18th holes and you will find lovely locker rooms in addition to 5-star service in the restaurant which serves Thai, Chinese, Japanese and Western cuisine. You are truly spoilt for choice when it comes to playing golf near Bangkok. In addition to the golf courses highlighted above you will find many other golf courses near Bangkok including Legacy Golf Club designed by Jack Nicklaus and Lakewood Links, which is a flat, links style golf course just 25 minutes from the city centre. Choosing a good base for a golf holiday does not come much easier than Bangkok. You have all the facilities and attractions of a capital city at your disposal yet you are under 40 minutes away from a selection of fantastic golf courses. Is there are any better place in the world for a memorable golf holiday than Bangkok?